The ground plan is a distinct form of visibility in the architectural process. The volume of the building, which took shape in the mind of the designer, is caught in its ‘grounding’ with the earth. The map fixes the three-dimensionality in a two dimensional way, which means that the greater part of the building is ‘lost’ and transferred to a new reality: its very outline on this earth. No matter how elaborate the walls, the windows or the spires are executed by the craftsmen, they are brought back to simple lines on a piece of paper. The ground plan is the great eliminator, cutting through the beauty of volume – that brave effort of men to imagine and conquer the endless space – and bring it back to a line, the borderline with the earth. The position of the (ground) plan in a quadralectic communication has to be realized in order to understand its significance. Man can define in the unlimited and undefined Space of the First Quadrant (I) a primary division. This mental act implies – within a quadralectic framework – a shift from the First into the (first part of the) Second Quadrant (II, 1). Space limited by stereometric planes becomes a Volume. This unqualified Volume can reach mental visibility (in the second part of the Second Quadrant; II, 2) when the boundaries of its limitation are seen as surfaces (of a building). The selected content of the universe becomes in that situation part of a structural entity. The process of creation can continue to a state of imaginable visible visibility (or proposed reality). 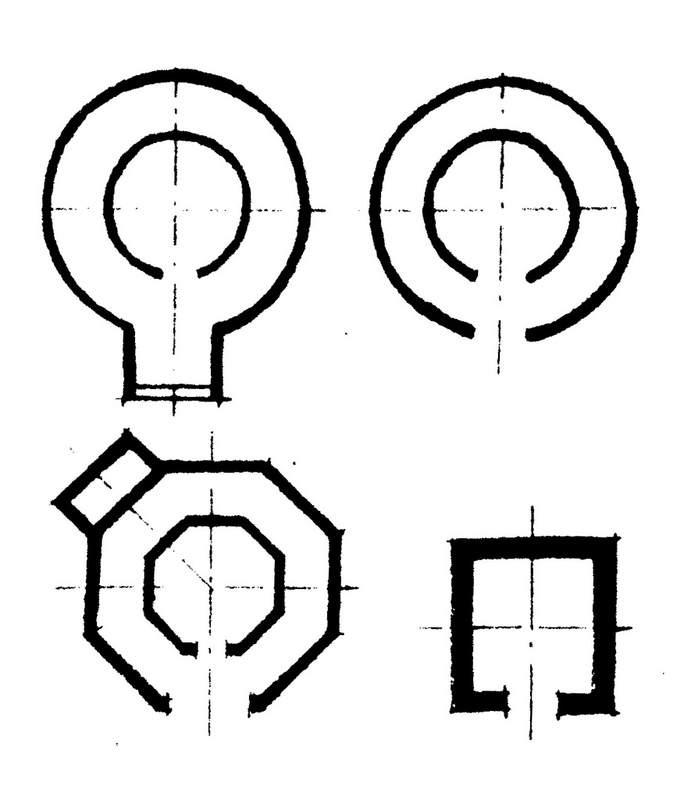 This position in the communication makes it possible to point to individual elements of the building, produce sketches of the details and/or (computer) models of its proposed final state, etc. It is here, when the communication reaches the third part of the Second Quadrant (II, 3), that the ground plan can be constructed (even if the building is not yet constructed). The ‘reality’ of the ground plan makes it possible to establish an ‘order’. The communication is situated in the fourth part of the Second Quadrant (II, 4) when such an act is performed. Any architect has to think about the arrangements on the ground before any work can be done. Form finds its first restriction in the possibilities of the terrain and the limiting capabilities of the environment. That action is mainly of a ‘Third Quadrant’ nature: being physically in the field, feeling the surface of the earth and taking decisions about the feasibility of building. The second restriction in the conception of a building is the notion of its future function, which is just as pressing at the start of a design. This subjective matter takes place in the Fourth Quadrant of a communication, where ‘moral’ issues are at stake. The function of a building is the apotheosis of its presence, but the initial intentions can vary over time. Churches can become mosques and end up as museums (like the Hagia Sofia in Istanbul). Other houses of God are now used as shops or will be converted into apartments. However, the most important decision an architect has to take before any kind of project can start, is the choice of the division environment in which the building will take place. Building-as-activity – like in any creative act – has to make the transition from the First to the Second Quadrant. It is here, at the breakdown of the original unity, that the ultimate width (and outcome) of a communication is decided upon, either conscious or unconscious. It will be clear that such a fundamental decision is of even more importance if the building of a house of a Supreme Being is concerned. The perfection of the original unity – identified as the First Quadrant – has to be copied to the broken world of division. This mission is doomed to failure, but mankind has been capable of inventing (and speaking) a universal language of geometrical forms to recall the lost world of unity and recreate perfection. The German word ‘Zentralbau’ captures a wide field of church buildings, which have their ‘central’ features in common (GÖTZ, 1968; p. 12). It includes churches with a round, square or octagonal ground plan, with a distinct middle point. The organization from this central point is essential, because this point represents, in a metaphorical sense, the Unity of God. The space around this point is centripetal or inner directed, while the single vertical axis is centrifugal or outwards directed. These churches of the Zentralbau-type have their historical roots in the so-called ‘Umgangstempel’, which were widespread in the Celtic heartland of Europe during Gallo-Roman times (fig. 101). Fig. 168 gives an illustration of different types of these Gallo-Roman temples. 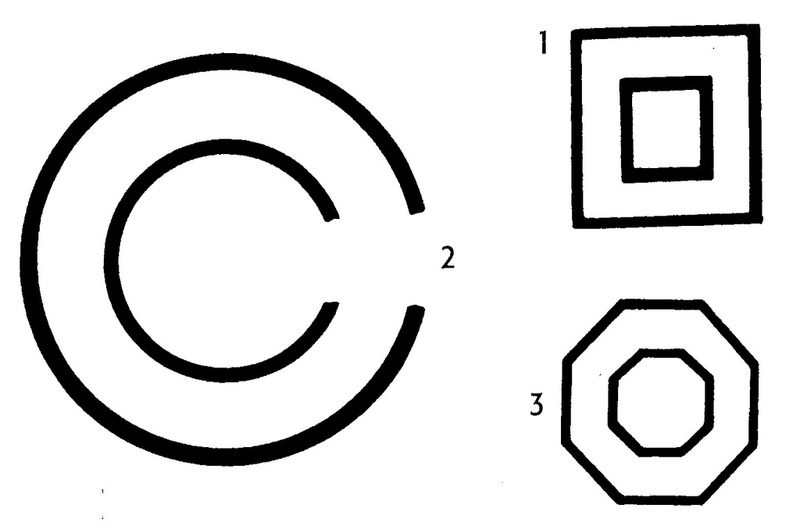 p. 28 of: STENCHLAK, Marian (1983). Fig. 168 – Examples of the so-called Gallo-Roman Umgangstempel feature a building with a central symmetry axis and a double wall. 1. Chill (Dép. Somme); 2. Crozon (Dép. Finistère); and 3. Plaudren (Dép. Morbihan). WIELAND, Günther (1999). These places of worship might have been the predecessors of the long line of Zentralbauten, which reached their zenith in the seventh and eighth century AD. They also had a lasting influence in the Roman and Gothic church buildings of the ensuing centuries (ECKSTEIN, 1975/1977).